Hi friends! I hope you are having a great day! I am SO tired! I've been non-stop go this week to make up for the past couple weeks and it might just be killing me. 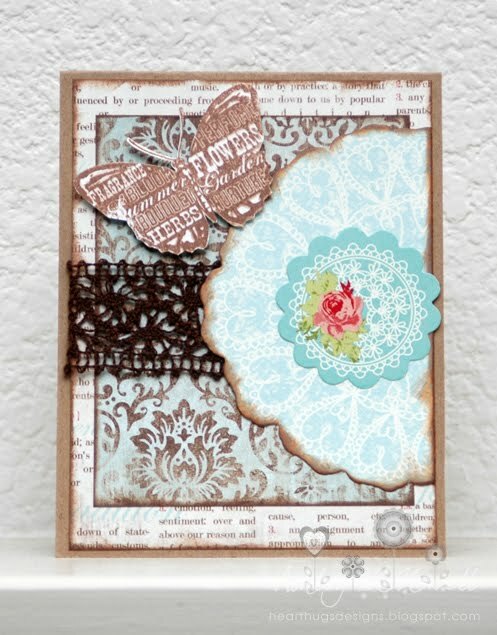 I made FIVE cards to submit to Scrapbook Trends magazine and totally forgot to submit them yesterday. GAH! Enough about me being a scatter brain! Here's another card I made at my friend Gina's house the other day. I think she has magic mojo air over there. :) I made this with some more of that awesome Colorbok paper and elements I got. I borrowed the butterfly stamp from Gina, it's from Inkadinkadoo. I also "borrowed" and by borrowed I mean stole that trim from Gina. (Don't worry, I gave her some ribbon the next day to make up for it!) I rather love this line! It's very inspiring to me and I'm having a lot of fun making things for me and not just because it's what I feel I "should" be making. love how you used that little scrap of ribbon. This card turned out so pretty. Love the colors too! SO pretty! LOVE this layout!! !